The Trinity River is one of those rivers that once you’ve been there you will be longing to go back. Breathtaking scenery and wildlife abound coupled with bountiful steelhead make the Trinity River one of our most popular destinations. Images of the big one that got away or your new personal best will linger in your mind making the experience unforgettable. The Steelhead in the Trinity River runs on average 4-8lb but fish up to 14lb are boated every year. Steelhead season on the Trinity River runs from August through March with the peak of the season in December. This part of the country can get cold so layering is recommended, waders and a rain jacket are essential. Nymphing is the most productive way of fishing here, though swinging can be very effective in the early season when the warmer water temperatures make the fish more aggressive. Trinity River has a healthy hatchery program so keeping hatchery Steelhead is encouraged. The Lower Sacramento River or “Lower Sac” as it is commonly known, is one of the most outstanding tailwaters in the country. Given its native wild trout population and regulated flow along with the areas moderate climate, the Lower Sacramento River is fishable nearly every day of the year. The portion that HarvestWild concentrates on is the 41 wild trout filled miles from Redding down to Bend Bridge near Red Bluff. 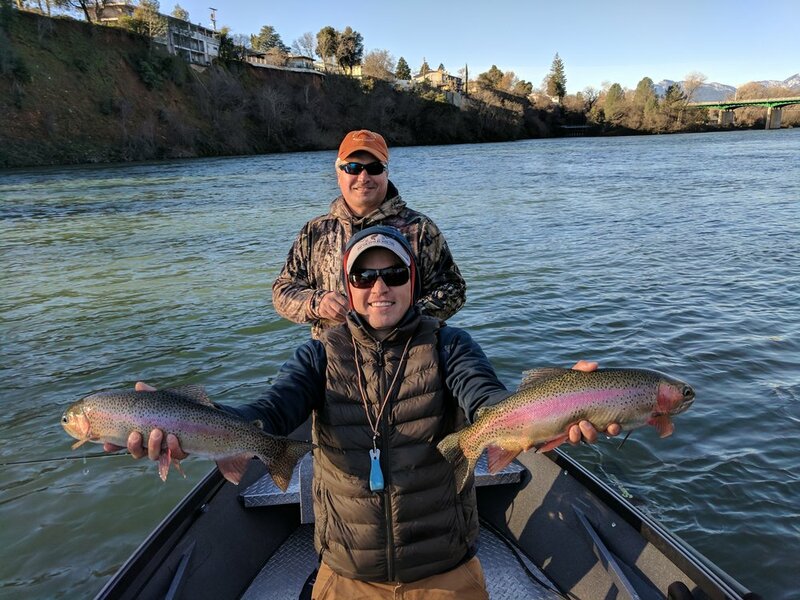 The Lower Sacramento trout fishery can be broken into two parts, the first part is referred to as “HOG WATER,” extending from Keswick Reservoir for 10 miles to South Bonnyview boat ramp. This stretch is where the Rainbow Trout average 16”-18” and commonly grow over 20”, fish in the 20”-25” range is well within reach on any given day. This area runs through the heart of Redding so this is not a wild and scenic stretch of river by any means but when the fishing is hot and the line is screaming off your reel you will forget that you are floating through a town of nearly 100,000 people. The second part is the lower portion from Bonnyview down to Bend Bridge. This is a unique portion of river running through farmland as well as BLM property. There are Rainbow Trout, Steelhead, Stripper, Carp, Largemouth, Smallmouth and Spotted Bass. We primarily target Rainbow Trout in this area but there is an opportunity to get a Lower Sac slam consisting of three of the listed species. This is hands down one of the most unique and fun floats in Northern California. The Upper Sacramento River raft trips are adventurous while offering stellar fishing opportunities. The fish here fight like little Steelhead jumping and pulling line off the reel, seeing your backing is not uncommon. This river is dominated by Rainbow Trout though Brown Trout and Spotted Bass do lurk these waters. We offer a lower float which heads down into Lake Shasta making it a great trip to combine catch and release trout fishing with some catch and keep bass fishing in the spring. The Spotted Bass found here have delicious white meat that is perfect for fish tacos after a day spent fishing hard in a picturesque location. Though we primarily indicator fish this section of the river, streamers and dry flies are always an option. Rafting the Upper Sacramento River takes place March through June. The Klamath River is a phenomenal steelhead fishery located in the most northerly portion of California. We specialize on the stretch from Iron Gate Dam down river to the I5 Bridge. This stretch of river meanders through high desert sagebrush and cattle ranches. Osprey, eagles and river otters are here to greet you as you float this majestic river. The only way to describe the fish in the Klamath is grabby. When they are on the bite you can’t beat this river. 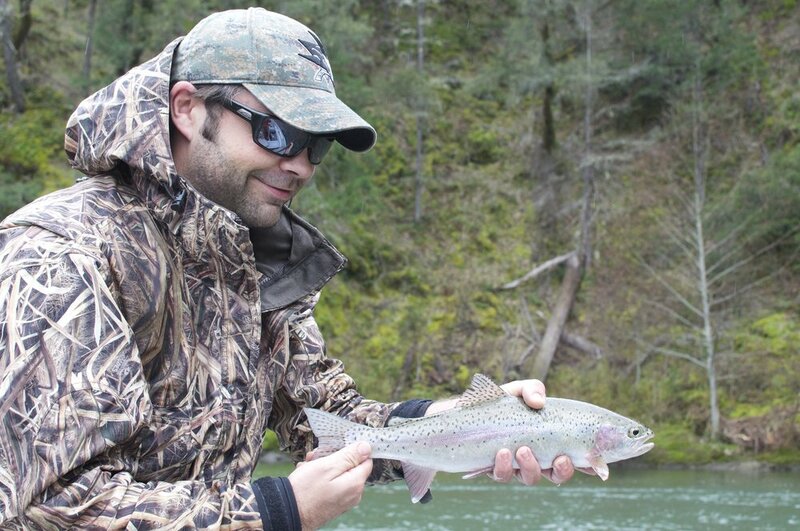 We recommend the Klamath River for anyone looking for a first-time steelhead experience or just a fun day of fishing. The season for the Klamath River runs from October through February. There is also a late spring season where there are prolific hatches of Golden Stoneflies and giant Salmon flies. The spring hatches can be hard to time but we encourage phone calls or emails and we can update you as to how the hatches are going in these areas.